Pupils should be encouraged to look away from their teacher when answering a question, scientists have found. Far from daydreaming, children who avert their gaze when considering their response to a question are more likely to come up with the correct answer. 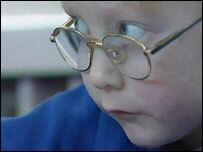 Stirling University psychologists found that, when looking away, five-year-olds answered 72% of questions well. But when children had not been instructed to look away when thinking, they answered just 50% correctly. The experiment, conducted among 20 children aged five, backs up other studies carried out by the Stirling researchers, which suggest that by the age of eight, children instinctively avert their gaze when considering a response to a question. Dr Gwyneth Doherty-Sneddon from Stirling said taking the gaze away from the human face was very important when trying to concentrate. "Looking at faces is quite mentally demanding," Dr Doherty-Sneddon told the BBC News website. "We get useful information from the face when listening to someone, but human faces are very stimulating and all this takes processing. "So when we are trying to concentrate and process something else that's mentally demanding, it's unhelpful to look at faces." The researchers believe teachers and parents often mistake "gaze aversion" for children failing to understand a question and do not give them enough time to compose an answer. "The mistake adults make is to interject too quickly, they need to try and hold back," said Dr Doherty-Sneddon. "If they avert their gaze, it's worth waiting because they are probably trying to come up with something. "There is this idea of 'look at me when I'm talking to you', but it should be okay to look away at some point of the interaction." If a child looked blankly at an adult when asked a question it was a good indicator that the question had not been understood, she added. The research, funded by the Economic and Social Research Council, was published in the British Journal of Developmental Psychology.